Are you faced with too much basil in your garden? Last year when we planted fresh basil we struggled to get enough to even make a few tomato salads. We use basil in just about anything we cook that we can jazz up the flavour like pasta, salads, dips, meat and potatoes etc. Basil in oil is a wonderful thing and if you haven’t tried it you are missing out on some incredible flavours.I don’t know many people who don’t fancy basil but you can get all sorts of different types of basil such as lemon-basil and chocolate-basil as well. You can easily grow a garden in a small space including herbs all you need are small pots to get your seeds going and before you know it you will have more basil than you know what to do with. It’s not as lucrative of a herb as mint is that grows like a weed but with some love and care this plant will grow in abundance for you depending on where you live of course. Pairing basil and garlic together with some extra virgin olive oil is like a match made in heaven. If you enjoy the freshest ingredients on your dinner plate it doesn’t get any fresher than this. Another idea we had with our fresh basil was to make basil oil. We simply drop in fresh basil leaves into a good quality cold-pressed extra virgin olive oil and let the flavours marry. Can basil be frozen? Good Question but it comes out wet and wasn’t the best for us. Since freezing basil on its own didn’t turn out for us so well we needed a plan b and the basil garlic cubes were born. This year we purchased 4 packages of Italian Basil from the Dollar Store at 2/$1.00 for a decent amount of seeds. You can’t go wrong at that price so we made sure we got enough to spread all over our 2 large planters. Once planted we watered them daily and kept them outside on the deck where they received the direct sun for 80% of the day. In the evening we would give them each a can of water and made sure they were well moist. In just over 2 months the basil has grown so much we are in awe. I honestly don’t think we expected to see as much basil as we have in comparison to last years crop. Since we don’t like to waste food we wanted to come up with ideas to use up this basil especially since it’s fairly pricey to buy fresh at the grocery store. If you want to buy a small handful of fresh basil in the shop it costs around $1.99. There is no way we were letting this go to the compost heap. In the end we will dry what is left and crunch it up to put in our spice jars. 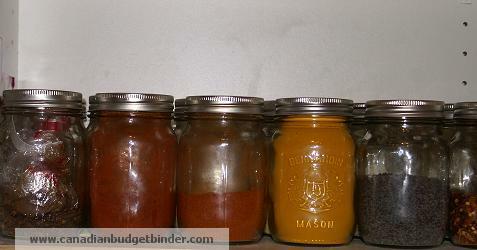 We have a variety of spices in labelled mason jars in our cupboard and use spices in almost every dish we cook. Since purchasing a Kitchen-aid food processor (love it) earlier this year we were thrilled to see what we could whip up. 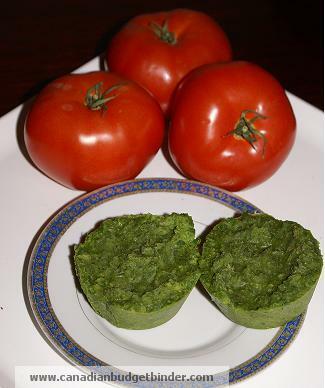 We decided to see if we could purée our basil with garlic and freeze it to use over the Canadian winter in our recipes. We chose to try our idea out and it worked perfectly. It’s essentially a frozen basil pesto but one you can use all year-long created from herbs from your garden. We made a few trays but realized we could do it another way that wasn’t so tedious. 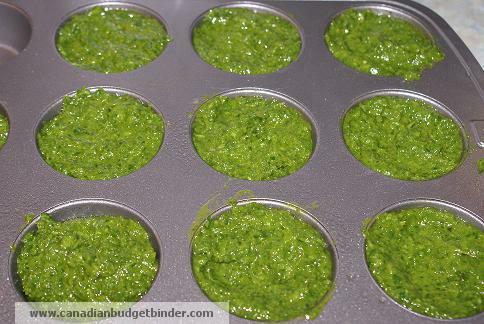 We decided to fill muffin tins with our custom basil garlic or garlic basil, whatever you want to call it, we call it yum. We especially like it on top of some fresh homemade kalamata olive bread, olive pita bread or dip our garlic onion potato balls in the dressing before we freeze it. Once you pop the mixture from the muffin tin buy running a butter knife around you can easily freeze them as disks. We then store them in Ziploc freezer bags for the winter. We can now enjoy the taste of fresh basil or garlic greens all year-long. This is such an easy process and if you have a food processor and love your fresh herbs go ahead and blend them up. We have kept the basil cubes frozen in our freezer for about 1 year without any problems or loss of flavours and use it in as many meals as we can to boost the flavour. It’s essentially a mix of herbs, olive oil, garlic, nuts and cheese in our house but sometimes we like to keep it simple and omit the nuts and cheese like we have here today with this basil garlic dressing but you can turn it into a pesto very easily. **Note** You can also add Pine nuts, Walnuts or Almonds along with Parmigiano-Reggiano if you want to make this a pesto. Put all ingredients in the food processor and whiz it around until it comes together. If you need to add more olive oil do so from the top until it comes together like an oatmeal consistency. Spray a muffin tin with cooking spray and spoon fill the tin with the mixture. Cover it with plastic wrap and put it into the freezer. Once solid run a plastic knife around the edges and pop the basil disk out. There you have it, a fresh basil disk ready to go into the freezer for future use. I don’t know how long these will last in the freezer as this is the first year I’ve made them. Update 2013: We’ve used these all year-long and have had no problems with them so far. I’m expecting they will last for a while but in our house we use so much of it that it will be gone before we know it. Update 2015: We make the basil cubes every year and we can safely say they’ve kept well for a year in the freezer without loss of flavour. 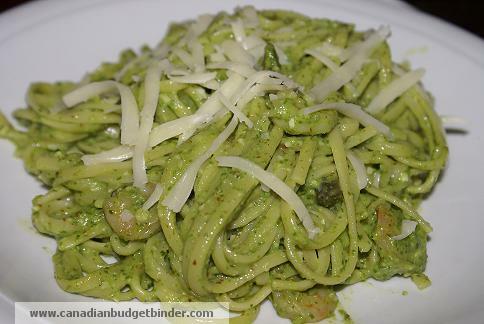 What to make with basil pesto? Here is what we made for dinner but you can easily add these cubes to make your favourite salad dressing to get the freshest flavours available to you especially when prices rise over the winter months in the grocery stores. We love to eat a fresh basil and garlic pasta so this recipe below will knock your socks off if basil is one of your favourite herbs. Add 1.5 cups of Basil Pesto (make as above in processor but add 1 cup of Almonds, 1/2 cup fresh Italian Parsley and 1/2 cup of Parmigiano Reggiano *Note you may need to add a bit more extra virgin olive oil as it purées. Top with your favourite cheese and enjoy! Taste= AMAZING and the colour is so green and vibrant from the basil, parsley and garlic. You can smell the freshness of the ingredients. A must try and super easy to make and won’t hurt the budget. This is an excellent idea. I was wondering what we’d do with excess basil if we did grow it b/c I know we won’t probably use it fast enough. And I’m glad you told us where you got the seeds from. Dollar Store!! Who knew! We love cilantro b/c basil is so hard to find here, expensive, and it keeps for such a short time but if we grew it ourselves, it would always be fresh & inexpensive. I don’t know if I love the smell or the taste of the herbs more. Do you have any good tips for storing fresh basil once its been cut?? I know it doesn’t do well in the fridge but then again it doesn’t do well on the counter in a bag either. Maybe outside of a bag but where??? Thanks again Mr. CBB! If I have excess basil I just lay it all out to dry then crunch it up and put in a jar as a dry herb. You could also tie it all together and hang it to dry. We’ve ordered seeds on Ebay before so that’s another option if you struggle to find them at Dollarama or your local dollar store. I’ll be making mint cubes this year as well just so we have flavours for our meals all winter long. It’s super easy but I find the muffin tins less messy than ice cube trays. very impressive! you can’t go wrong with too much basil. we just found out there is a wild basil growing just about everywhere around us, and replanted them in the garden. The taste is good and it is used to the weird tropical weather (too much rain, too much sun) whereas the basil we brought from the capital city, a colder climate, is having a hard time rooting. I hope I have so much I can freeze, at the moment I go out every time we make pizza or pasta to pick up a little bit. I’ve never had a wild basil that’s awesome.. so it tastes the same? Basil is my all time favourite fresh herb and that’s why we grow so much…. it tastes pretty much the same, a bit more acid, delicious when cut or chopped but didn’t do well in the blender, I guess the acidity comes from the branches and I didn’t cut the leaves properly. still in testing phase! Nice idea with the freezing, although if you’re not sick of pasta sauce yet, this sauce (http://35aweek.com/2012/04/26/bacon-and-tomato-cream-sauce-for-pasta-2-70/) is great with tons of fresh basil leaves in it. You could also make a lemon-basil sugar that keeps for a while: just grind a small handful of leaves in a food processor with 1/2 cup sugar and about a teaspoon of lemon zest—it’s great on desserts, and with berries and/or yogurt. And, of course, nothing beats a light lunch or appetizer of sliced fresh tomato, some basil, some mozzarella, and a drizzle of olive oil! Great Idea! My solution last year required too much room in the freezer. What was your solution last year? 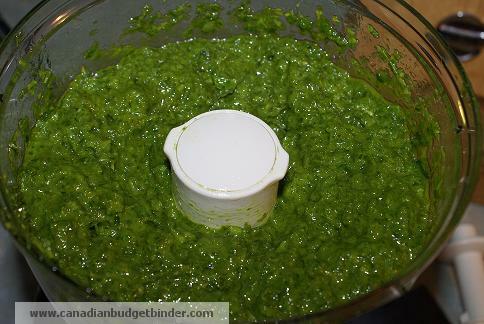 I need to buy a processor so I can have homemade pesto–I love it but I know that I can make it a lot cheaper and in bulk if I have the processor. What a great idea! I will definitely use this when I do my garden next year. Last night’s dinner had me drooling, it sounded so good! ok I am doing this….my basil isn t looking as good as yours.